When searching for new music, I sometimes stumble across a band whose music is described as something I would definitely enjoy, but upon listening the music still surprises me. 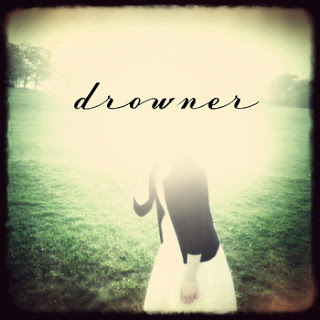 Texan shoegaze act Drowner pulled that off earlier this year with the release of their debut self-titled album. This isn't one of those discs where the cover art intrigued me enough to give the album a listen. It was tagged as shoegaze music, which was a style I was really into at the time. I listened to a track from it and enjoyed it. So much time has passed and I still have not gotten around to reviewing this album, until now. While treating you with the style of sound most commonly referred to as shoegazing, Drowner also borrows textures and techniques from post-rock, dream pop, psychedelic rock, and ambient. What is left is an intriguing blend of all of the above styles. This album is thick with reverb and distortion, off-kilter drum patterns, and the occasional vocal hook that leaves listeners yearning for more. My one issue with this disc is that the vocals are extremely ordinary and don't exactly pop. This may be what the band was going for, but it struck me as odd and a bit disconcerting. Lyrical hooks are repeated more often than punk and grunge bands repeat hooky lines from singable choruses. If you can get past the vocals and lyrics, there is plenty to be enjoyed here. In this album, the vocals are often overlaid and sometimes juxtapose with cascading ambiance and post-rock atmospheres. Casual, slender tones of earthy guitar melodies highlight some tracks, while on others, heavy rock riffs overtake the keyboard atmosphere. While this band is certainly talented, they can hopefully improve on their vocals with their next disc. With better vocals, this would be a can't-miss album of 2012. Enjoy a couple of the standout tracks below. Thanks for reading!